Lock in a great price for TURIM Av. Liberdade Hotel – rated 8.1 by recent guests! Great location - within a block of the metro which is the key to the city. Nice front desk personnel. Nice bathtub with plenty of hot water. Staff was outstanding! Helped us with many issues. Front desk staff was welcoming and helpful. Very central location but not noisy. It’s only a few steps from the train station and several taxis are always waiting outside. Did not use the breakfast. A clean modern comfortable hotel near to a Metro station. The Turim Liberdade Hotel is a 20-25 minute stroll to the Praca do Comercio however if you don't feel like walking, taxis are very reasonably priced. The hotel is located in a safe part of the city. The staff in the hotel are extremely pleasant and were very helpful during our stay. Everything was fine except the beds, they were quite uncomfortable and the pillows as well. I didn't get a good sleep in two days. Location was Perfect, metro outside the door. Lovely restaurant. Quiet area. Staff very friendly and helpful. Good location, well priced and a good choice for someone using the hotel as a base. Right next to a metro station. The property is well located for business travelers. There is a taxi station just in front of the hotel. For those willing to take the subway, the station is Marques de Pombal (metro lines yellow and red) easy to connect from the airport. The hotel is near 2 subway exits. In case someone is too tired to go out and enjoy the various restaurants nearby, the hotel has a good restaurant open for lunch and dinner. TURIM Av. Liberdade Hotel This rating is a reflection of how the property compares to the industry standard when it comes to price, facilities and services available. It's based on a self-evaluation by the property. Use this rating to help choose your stay! 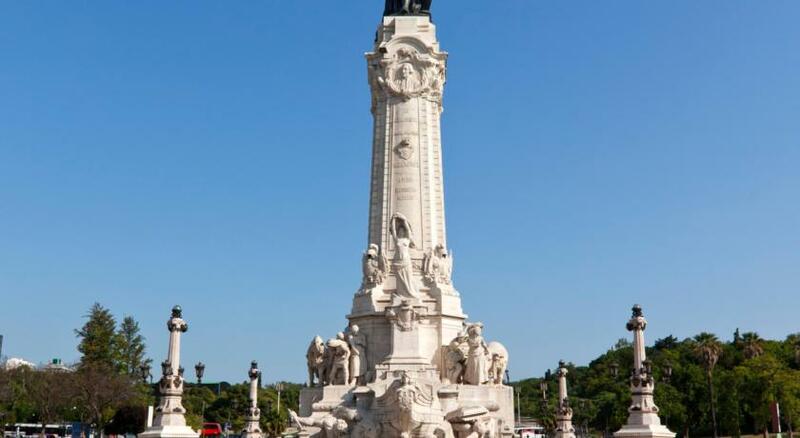 One of our top picks in Lisbon.On Avenida da Liberdade (Liberty Avenue), Hotel Turim Av. 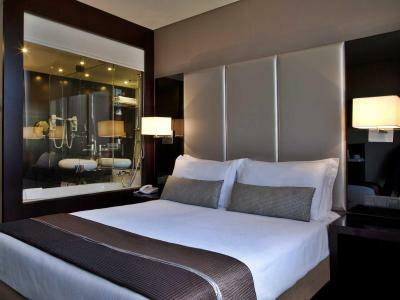 Liberdade is a modern 4-star hotel. It is completely non-smoking and has air-conditioned rooms with free Wi-Fi and a minibar. Facilities include a 24-hour front desk and room service. The rooms at Turim Av. Liberdade Hotel are decorated with contemporary furnishings and natural colors. All rooms have internet TV and a private bathroom with oversized mirrors. 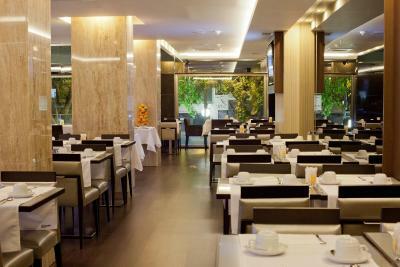 Guests can enjoy Portuguese dishes and international fare at Turim Av. Liberdade's restaurant. The bar features a variety of drinks and snacks. This Turim Hotel has a laundry service along with a car rental. There is also a business center with computer terminals. Central Lisbon is just over 1 miles away, and is where guests can visit the Castle of São Jorge and the Lisbon Cathedral. Marques De Pombal Metro Station is just a 2-minute walk from the hotel. When would you like to stay at TURIM Av. Liberdade Hotel? Featuring a modern décor and large windows, this room has air conditioning, a flat-screen satellite TV and minibar. 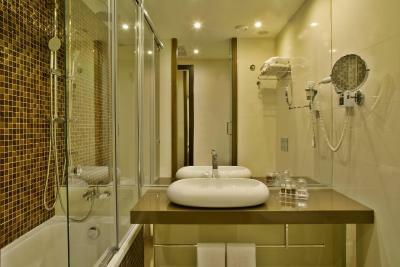 It also offers a private bathroom with toiletries and a hairdryer. This air-conditioned room features a flat-screen satellite TV, minibar and a private bathroom with free toiletries. This twin room has air conditioning, a minibar and satellite TV. Founded in 1992, the steadily-expanding Turim Hotels has expert professionals dedicated to assisting it’s guests. The varied network of properties includes quality and comfortable units located in the city, in the countryside and by the sea. House Rules TURIM Av. Liberdade Hotel takes special requests – add in the next step! TURIM Av. Liberdade Hotel accepts these cards and reserves the right to temporarily hold an amount prior to arrival. There was a sewer smell that would pop up in the lobby and once in the room. Could not get the room cool enough. Able to cool the room with an open window but that left us susceptible to street noise (garbage trucks) overnight. Tea and coffee not replenished so you only had one days supply, same for toiletries. No point in having a kettle if there’s no drink to make! Room was small and dark and the bathroom smelled damp. Noise from other rooms was very intrusive. Staff ordered us a taxi to take us to the airport and charged more than double than when we arrived. We felt ripped off. We had made our booking 3 months before our trip through booking, yet we were surprised to be informed that the hotel is fully booked and we were transferred to a different branch of Turim hotels. Although the hotel we got transferred to is 5-star hotel, yet it was not convenient to have a change of rooms due to lack of availability. We chose that specific room and that specific hotel based on certain preferences that were not met. Lack of information on check in, poor service in the restaurant, phone didn’t work in room, slow reception staff and the bellboy literally chased me to grab my bag even after saying I was fine twice! Need better staff. Room had hardly any books where to hang your coat, hat, etc. Nice location. Good breakfast. Friendly staff. I think there can put some more tea bags not just 2. And no where to put the soap after wash the hands. And no 2 small towels for the face. I think for 4 star hotel little bit limite. If no rest it was ok.
- It was cold in the room, - The restaurant was open just until 7 pm. - The customer services was really great, - I loved the music in the bathroom, - Very well located, - The breakfeast was really ok.